Black smoke billows from a controlled burn of surface oil during the 2010 Deepwater Horizon oil spill. A new study by NOAA and the Cooperative Institute for Research in Environmental Sciences (CIRES) found that controlled burns released more than one million pounds of sooty black carbon into the atmosphere. 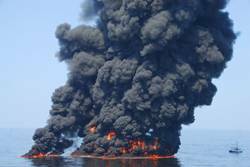 During the 2010 BP/Deepwater Horizon Gulf oil spill, an estimated one of every 20 barrels of spilled oil was deliberately burned off to reduce the size of surface oil slicks and minimize impacts of oil on sensitive shoreline ecosystems and marine life. In response to the spill, NOAA quickly redirected its WP-3D research aircraft to survey the atmosphere above the spill site in June. During a flight through one of the black plumes, scientists used sophisticated instrumentation on board, including NOAA's single-particle soot photometer, to characterize individual black carbon particles. The black smoke that rose from the water’s surface during the controlled burns pumped more than 1 million pounds of black carbon (soot) pollution into the atmosphere, according to a new study published last week by researchers at NOAA and its Cooperative Institute for Research in Environmental Sciences (CIRES) in Boulder, Colo.This amount is roughly equal to the total black carbon emissions normally released by all ships that travel the Gulf of Mexico during a 9-week period, scientists noted. Black carbon, whose primary component is often called soot, is known to degrade air quality and contribute to warming of the Earth’s atmosphere. The new study, published online this week in Geophysical Research Letters, provides some of the most detailed observations made of black carbon sent airborne by burning surface oil. “Scientists have wanted to know more about how much black carbon pollution comes from controlled burning and the physical and chemical properties of that pollution. Now we know a lot more,” said lead author Anne Perring, a scientist with CIRES and the Chemical Sciences Division of NOAA’s Earth System Research Laboratory (ESRL) in Boulder, Colo. Global surface temperature Anomalies - August 2011. Black carbon is the most light-absorbing airborne particle in the atmosphere and the reason for the black color in the smoky plumes that rise from the surface oil fires. Black carbon can also cause warming of the atmosphere by absorbing light. Prolonged exposure to breathing black carbon particles from human and natural burning sources is known to cause human health effects. During the 9 weeks active surface oil burning, a total of 1.4 to 4.6 million pounds (0.63 to 2.07 million kilograms) of black carbon was sent into the atmosphere of the Gulf of Mexico, the study estimated. The study found that the hot soot plumes from the controlled burns reached much higher into the atmosphere than ship emissions normally rise, potentially prolonging the amount of time the black carbon can remain in the atmosphere, which would affect where the black carbon ends up. The researchers also found that the average size of the black carbon particles was much larger than that emitted from other sources in the Gulf region, and that the emitted particles produced were almost all black carbon, unlike other sources such as forest fires that tend to produce other particles along with black carbon. “The size and makeup of the black carbon particles determine how fast the particles are removed from the atmosphere by various processes, which ultimately affects their impact on climate,” says Perring. Larger particles are removed from the atmosphere more quickly and thus have smaller climate impacts. And, those same properties of black carbon are important for assessing human health impacts. Finally, Perring and her colleagues found that of the oil that was burned, 4 percent of the mass was released as black carbon, an important metric rarely observed during cleanup of an oceanic oil spill, which could help guide future decision-making. The new paper, Characteristics of Black Carbon Aerosol from a Surface Oil Burn During the Deepwater Horizon Oil Spill, has 15 co-authors from NOAA ESRL and CIRES and can be found on the Geophysical Research Letters website. As part of its response to the Deepwater Horizon oil spill, the unified federal response team used controlled burns to remove oil from the open water in an effort to minimize impacts to the shoreline and marine and other wildlife. For more information about the federal response to the Deepwater Horizon oil spill and ongoing restoration efforts in the Gulf of Mexico, visit RestoreTheGulf.gov.